Just a curioous question. To use this product in a situation would you apply it to a candle that is representative of the issue such as pink or red for love issues or green for money issues, white for health, etc? Thank you!! But I would just use a little bit of the oil. If you're going to use money oil on the money candle, you can put a little Blockbuster on it. However, I prefer lighting a candle all by itself prior to the other spells. So, for instance, if I am going to perform a complete love ritual or money ritual, I would start out with a chime candle and use that as a blockbuster candle. Then, after the 1& 1/2 hours that it takes for tis candle to burn out, then I would start the other ritual. So set a candle related to the work with the oils and pray over it and when it goes out start the work without the oil? Makes sense as though the break through happens you start doing the work as expected! Thank you! I'm moving to a new place after living around some really subtly negative people (stagnant and spiritual dead zones abound!) I just ordered Blockbuster oil and happen to have a 7 African powers banded candle hanging around. I was thinking of dressing it with the blockbuster and appropriate herbs - dedicating each color to a corresponding area of my life that I want to remove blocks from... Any suggestions on how you would mix up this kind of work if not at all? You know, I wouldn't do that. Having been raised around Santeria my entire life, I just don't think it's a good idea to work Blockbuster with all 7 Orishas. So how exactly would this product work in say reconcilation work? Would you write for whatever you want and it blow up everything in the way? Even if the other person is emotionally distraught at the moment. Just curious if the explosive aspect of the product would work against that or if it would actually help them get over that by blowing it away! Thanks!!! You know, I have been having terrific success with the blockbuster products. But, I've been doing things a little differently. I do the blockbuster spell first and then just ask: "Remove all obstacles that prevent me from getting ____"
Then, I just finish that spell. In about 5 days (and this has been consistent) I see progress. I heard that after performing a blockbuster spell, there is a lot of spiritual "rubble" left behind that needs to be cleared away using Van Van. Can anyone advise on this? It sounds completely logical, especially after reading the blockbuster page, "Block Buster is sudden in its action, and will not necessarily create a delicate roadway to walk on" and also "Block Buster does not care what brought the problem into existence or how it is being sustained -- it just blows everything in your path to Kingdom Come." -I am thinking I would definitely want to follow up this type of work with van van to clear away all the spiritual debris that is left behind in the wake of a blockbusting, your thoughts? It depends really. Some people may not need to follow up, others will. But it certainly is a good idea. I was taught to remove negative then replace it with the positive. So if I clear away a mess I replace it with what I want. So with that in mind what you are saying makes sense. Read the versus in the Bible that the spell uses as well its about being able to do something against all odds... I will make a way in the wilderness, and rivers in desert. Im really interested in this oil, could this oil be used in those stubborn cases where lets say a target is strong willed or influenced by others? Will it blow the outside influences on my target to smithereens and kingdom come? I'm not sure if I understand the question. You want someone to return to you? Is this the purpose of his question? Need to be a little more specific. Well, for example, I've been working on my ex to be more involved with our daughter, and he was doing better, then his demon mother finds out that he and I are talking again and he's in our daughters life, and boom overnight he disappears and we have no contact with him. Demon mother in law and him were not getting along while he was engaging with us. Basically she controls him and hates me for divorcing him and filing for child support and "taking his money". I used your products and did what I had to do as far as ensuring I got what was due to me and our daughter in the divorce. I've tried uncrossing him, but whatever is on him seems to get stronger when I do reversibles or uncrossings, and hes withdraws and gets irritated and angry and runs to his mother, and then i get discouraged and stop the uncrossing. So, I'm thinking of using the blockbuster oil, then the uncrossing, protection and then work a honey jar or a come to me. I'm just thinking things thru right now. Either way, the blockbuster oil sounds fantastic! Well, for example, I've been working on my ex to be more involved with our daughter. He was doing better, then his demon mother finds out that he and I are talking again and he's in our daughters life, and boom overnight he disappears and we have no contact with him. Demon mother in law and him were not getting along while he was engaging with us. Basically she controls him and hates me for divorcing him and filing for child support and "taking his money". I used your products in court and did what I had to do as far as ensuring I got what was due to me and our daughter in the divorce. I've tried uncrossing him from whatever may be affecting him but whatever is on him seems to get stronger when I do reversibles or uncrossings, and he withdraws and gets irritated and angry and runs to his mother, and then i get discouraged and stop the uncrossing. So, I'm thinking of using the blockbuster oil, I'm just thinking things thru right now. Either way, the blockbuster oil sounds fantastic! This is exactly the kind of stubborn case in which Block Buster products are believed to help. You would not use the Block Buster oil alone, but add it to whatever it is you are using to increase your ex's involvement in your child's like. You might also conside a sweetening spell on your ex's mother, as it is very hard to break the bond between a mother and a son, and so we sometimes get better results from changing her attitude, so that where she was one angry and hostile, she becomes pleasant and conciliatory. I will do as you have suggested with the mother, and I will add the blockbuster oil to my work , thank you so much for your reply. I see some saying that an Uncrossing is a good idea before a Block Buster... if someone needs an uncrossing. On the Block Buster label it says "Curse lifter / Spell Breaker / Jinx Remover". Would this oil suffice to remove enemy blockages without the Uncrossing step? Or can these oils be mixed together on one candle? lionsrule, If it were me, I would mix them together, kill two birds with one stone, so to speak. If you are dealing with crossed conditions you don't want to skip the Uncrossing. I have ordered the block buster oil and herbs from LM to carry out the spell on the block buster page of the site. I was just wondering if it would be a good idea to get some more red candles and burn one dressed in block buster oil with an appropriate petition underneath once a week to back my work up? Or would a different colour candle be more appropriate? First off, yes, I think doing a single candle burn once each week as back up is a good idea. Thank you very much for your help ProfessorAmes. All of my block buster products arrived earlier this week and I am planning on doin the spell from the LM website tomorrow. I know that this may seem like a silly question, but when dressing the candle with Block Buster Oil do I dress upwards or downwards? I know upwards is to draw to you, etc, but I'm stumped with this. Not all forulas are for drawing or for repelling -- a number of them, like Reversing, Block Buster, Road Opener, and the like are bi-directional, omni-directional, or non-directional. I consider Black Buster to be omni-directional, but since a candle is linear, i would dress it both up and down from the center, on either side of the column, in the style called "magnetizing" the candle, as described and shown in old hoodoo teaching books like "Legends of Incense, Herb, and Oil Magic and in my own more recent book "The Art of Hoodoo Candle Magic." Thank you for your help and advice Miss Cat. I usually place an order with you monthly, so I think I will have to treat myself to your book, as I am putting my list together this evening. Hi, I'm contemplating purchasing a few Block Buster vigil candles. I would like something to help with breakthroughs in different areas of my life. 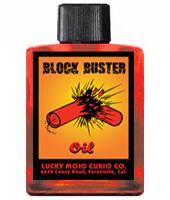 Can I use the Block Buster vigils with LM oils for work, career, money, family, etc. ?? Do I fold my petition paper away from me, and once to the left to remove the mess/obstacles? Or towards me and once to the right, to draw in the new breakthrough?? How exactly would you recommend disposing of a Block Buster vigil after its preformed? Looking forward to your thoughts..
You absolutely can use the Blockbuster candles to work on different areas of your life - it's an excellent way to work. The idea of a blockbuster is to remove the obstacle, so fold away from you. Be sure to write your petitions in a way that signifies that - "Remove all obstacles, blocks and enemies from my path. Vanquish any foe or stumbling block that keeps me from my goal in my (career, with my family, with acquiring money, etc.). At the same time you might want to follow it up with some attraction work. Once you break down that roadblock you'll want to pull something into that space you've just opened. In the case of attraction, you'll want to fold the petition paper toward you. The glass of a vigil candle poses some issues in disposal. If there is some residual wax or perhaps just the petition paper you can take that small amount to a crossroads, which has great significance to the blockbuster and road opener work. For the candle itself, recycle it as you would a glass jar. This morning I got up at dawn and took a 13 herb bath before work and disposed of some of the water at the crossroads in preparation for this work. I have followed the spell on LM to the letter after coming home from work. I was just wanting to know if it is alright to snuff the candle and relight it, as it is quite large and will take a very long time to burn down. It has been lit for around 2 hours so far. The flame is currently extremely tall and very steady, but it is after 8pm here and in a few hours I will need to go to bed, so I just wanted to check about the snuffing and relighting. You can work this way if you need to. Just make sure to snuff it out like you said, you don't want to blow the candle out. Miss Cat if you blend Block Buster Oil with Money Oils how would you dispose of the remains, by the crossroads or in your backyard? Since one is to explode the obstacle and the other is to draw in? This is in response to the person who has a temporary job and wants perm. steady work. Depending on the situation, I would use both Blockbuster and Steady Work products. I have a client who has a temp job and several factors need to be considered before employer makes a decision (if it fits their budget, changing from temp to perm, which temp is more productive than the other, likeability factor etc.) Of course, you should pray and do everything in the mundane to manifest. But using both steady work and blockbuster is a good option. Good Luck!!! I would do it separately. One candle for blockbuster and then another to bring in money. Thank You for responding. So just to be clear I would take both of the remains to the crossroads? If this were me, I would bury the money drawing in my front yard. If I had a tree in my front yard, that would be even better!! According to the spell as listed in the block buster page. It specifies a 9 inch candle. Can I use a 4 inch red candle instead? It's to bust away all obstacles for love reconciliation work. 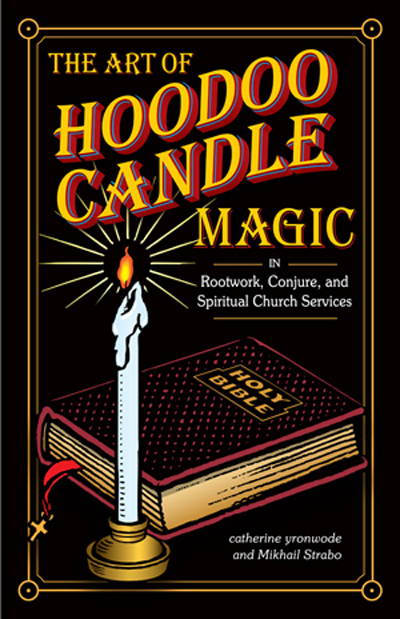 Miss Cat's book on candle magic is more about how to work with candles and less about the various oils and other products used in hoodoo (though several types are mentioned). But she does describe lots of ways of how to apply the oils to your candles. For blockbuster she is saying to start in the center of the candle and rub the oil up to the wick, then start back at the center again and rub down to the bottom of the candle. In the book it is referred to as magnetizing the candle. I think the 9 inch candle in red is symbolic to the work as its represents the dynamite blowing away the trouble. a 4inch is more like a fire cracker! I wouldn't carve my name on the candle. I would just carve break down obstacles (in a spiral fashion, cursive writing, top to bottom with no breaks in your writing). A pepetition paper is what you would write your command. It would have something like: break down obstacles then covered by your name. I love the Blockbuster spell!! Which is best really depends on what type of love blocks you have. The difference between the two is a bit like this: if there's a mountain between the two of you, an accumulation of crap obscuring the road altogether, you've hit a dead end and need to forge forward, Blockbuster will act like spiritual dynamite (yes dynamite, use with caution, things can blow - but sometimes that's exactly what's required). If on the other hand, the road between the two of you feels like you're always hitting a one-way in the wrong direction, or things are long and winding and you'd like to find a bit of a straighter and quicker path, then Road Opener is more what you're looking for. Assess your own situation, and see which of the two examples fits better. If you are lighting the candle to break through obsticles that are preventing you from your love then you would add love oil. You can do the break up at the same time as this. Then follow it with a come to me spell to draw the person in. You can use either moon it depends on how you word the petition.. during a wax moon to increase wane moon to take away. Example. if doing during a wax moon to remove obstacles from love then pray that all the obstacles in your way be blasted away with the power ..if a wane moon may all those obstacles fall away and and be less prevalent .. If love work I would think of it blasting away so the love can come through ( wax moon) if for a cross condition or a wall im facing a wane moon to open the block and send the blocked work, energy away to clear my new path. hope this helps. I just got one of my orders, and I had ordered the Block Buster line. I am having a string of bad luck and jinx. I went for a job today, drive 45 km, and it didn't end up working. A light on my car is coming on now, and its not good. I have all of a sudden no cash coming in. Last year I had money. I want to know when is a good day and moon phase to do the Block Buster. I want it to be done the right way. Thanks. Can I use Block Buster oil and powder on a petition to a Saint? It depends on whT it is for and what Saint. It would go well with St Peter. That's a great idea! Especially if you do it on a Friday of a waning moon!! Please help me to do this spell. I use plain 7 day orange candle with blockbuster oil. Did I doing it right?